Even though “the fight of the century” was anti-climactic to those who set their clocks by wishful thinking, a variation on the theme of career development still lures us to the combative sports. 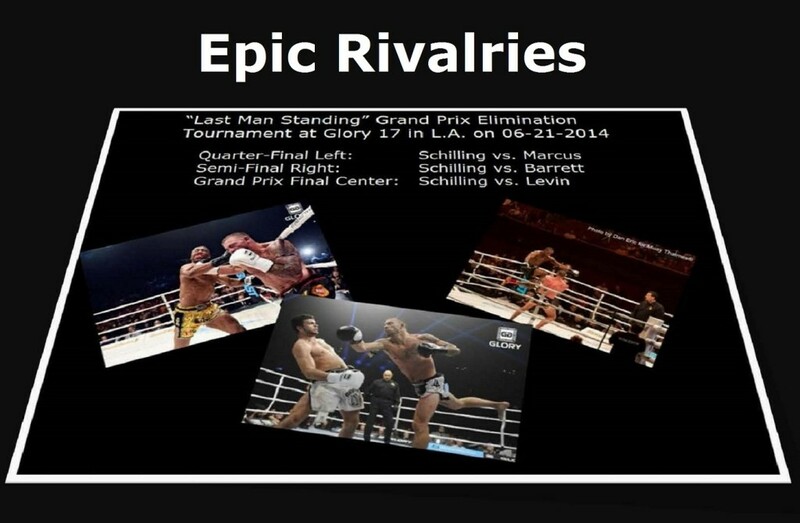 If you take the long view of the fight game, thus, pretty much every fighter will sooner or later meet his or her match. The rhapsody for fans is watching how this plays out over a fighter’s career. There are epic rivalries, thus, that produce milestones in the sport. This is where combative sports can eclipse even the NFL – in the sense that generations later fans are still talking about Ali vs. Frazier │ Louis vs. Schmeling │ Dempsey vs. Tunney – while who even remembers Super Bowl XVIII without the keyword “wardrobe malfunction”? With an exception to every rule, Lou Neglia manages some of the most successful box offices in the entire country around the organizing principle of career development. He’s even introduced us to a promising young musical talent in Sara Schulmann, who was a contestant on NBC’s “The Voice” and whom you can follow on Facebook. 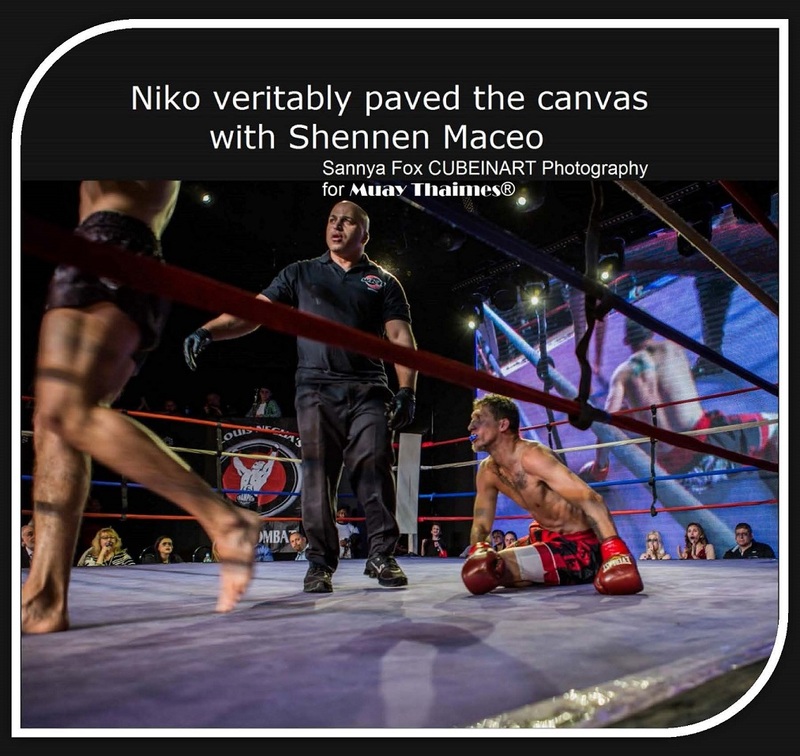 Niko Tsigaris (Lions Martial Arts in Brooklyn) vs.
Coming off a Villi Bello bump in the road that could have gone either way in Combat at the Capitale on October 17, 2014 – with the subsequent steam rolling of Lashawn Alcocks, who succeeded only in finishing on his feet this past February the 6th – Niko veritably paved the canvas with Shennen Maceo on home turf in Brooklyn. Referee Chris Wagner finally stopped it after the fourth knockdown in Round 1. So much for the three knockdown rule with Brain Crenshaw personally supervising the officiating in a New York statutory loop hole. WINNER: Niko Tsigaris by TKO at 1:20 of Round 1. Since Julio Arce now hunts fame and fortune in Lou Neglia’s Ring of Combat (MMA) cage – presumably aiming for a UFC berth in parallel with Team Serra-Longo’s Bellator prospect John Bowman, at the same time that Chris Mauceri has signed an exclusive contract with Scott Kent’s (Full Rules Muay Thai) Lion Fight Promotions – Niko Tsigaris has to be ranked a top K-1/Glory kickboxing title contender on the credibility of his 5-4-0 professional record with 3 first round knockouts in the course of taking on all competition to become the standard against which the entire WKA kickboxing cohort is measured. In the food chain with Glory World Champ Gabe Varga and #3 contender Shane Oblonsky, crop management is a matter of separating the wheat from the chaff. “The table was a large one, but the three were all crowded together at one corner of it: ‘No room! No room!’ they cried out when they saw Alice coming. ‘There’s plenty of room!’ said Alice indignantly, and she sat down in a large arm-chair at one end of the table. Alice looked all around the table, but there was nothing on it but tea. ‘I don’t see any wine,’ she remarked. Zarrukh Adashev (Lions Martial Arts in Brooklyn) vs.
Zarrukh’s affinity for the subtleties of interstellar collisions seems to orient his stylistic holistic towards Muay Thai’s orbit in the martial arts galaxy. Hurling Robert Walker through the ropes off first bell, for example, Adashev clocked him upside the head with what otherwise would’ve been a low kick. Tell me this isn’t a trademark Phanuwat ‘Coke’ Chunhawat tactic. Whenever the visitor from Joe Schilling’s home town tried to mount an offense, it was like speed dating the muzzle of a machine gun. With Ohio’s reputation for being a battleground state │ where you’d think the imminent Presidential campaign blitz would discourage fence sitting just for the sake of having a life │ Zarrukh wasn’t about to risk counting on undecided voters. A liver kick did the trick. Zarrukh won it not so much in a landslide as an avalanche. WINNER: Zarrukh Adashev by TKO at 2:56 of Round 2. Think of execution and improvisation as flip sides of the same coin, depending upon how much strategy informs battle tactics. Both pivot off whether you’re aiming to attack weakness or overcome strength as embodied in any tactical advantage. Within regulated weight brackets │ which requires a leap of faith by the very definition of statutory loop holes │ height comes with a reach advantage that plays off a presumptive strength differential in the trade off. So it was that the visibly taller Jamie Driver tried to exploit her reach advantage over Team Serra-Longo’s Jennie Nedell but couldn’t muster the deterrent to enforce it. Where the shortest distance between two points would have tempted Jennie into harm’s way, a skilled martial artist deploys tactics to turn her opponent’s strength into vulnerability. Off leading low kicks, Nedell’s spinning back fists and kicks closed the gap with smacks. Then Jennie took charge on the inside. Rabbit punching the Ever Ready Bunny in the middle round, Jamie only dug a deeper scoring hole for herself on the flagrant foul penalty point deduction. Whether “hell hath no wrath like a woman scorned”, Jennie exacted vengeance with a high kick upside the head that dropped the delinquent Driver for a count in the final frame. In the wrong place at the wrong time, with Team Serra-Longo on the hunt for a kill, Referee Tom Sconzo stuck his own face into Nedell’s right cross. Let me tell you. Tom Sconzo can take a punch. WINNER: Jennie Nedell by Unanimous Decision. Classical wisdom is sometimes distilled into “Know Thyself”. This nugget of wisdom is axiomatic in any prize fighter’s career development: that is knowing what you’re good at and what you’re not. You might be a power puncher, for example, but not able as Tom Sconzo to take a punch. Ducking a candid self-appraisal could be hazardous to your career. Think on Andrew Ball, who twice went toe-to-toe with James Smith, Jr. These were pure unadulterated slug fests. Although Andrew came out the winner of both, he also took his share of lumps at Glory 9 in NYC on June 22, 2013. (See BJ Penn’s concise narrative on the preliminary card play by play.) Despite a wing span that more often than not will give Lou Neglia’s Cruiserweight protégé a reach advantage, close quarters combat is always going to be more a matter of give and take rather than pick your shots. One hundred eighty-five pounds is ordinance enough to end anyone’s night early. So it was that Ariel Abreu got the better of Andrew in Combat at the Capitale on February 6, 2015. The comeback trail is where Andrew can show us whether he’s wiser for the experience. Success is gratifying but also perishable, unless we learn not repeat our mistakes. K-1/Glory Kickboxing rules │ 185 lbs. │ 3×2. WINNER: Andrew Ball by TKO at 0:30 of Round 1. The human element plays off a solitary Muay Thai match. It was wedged between 17 different strokes for different folks. That’s where Referee Chris Wagner warned Malik Blake – in defending of his WKA NYS Amateur Muay Thai Title – for a K-1/Glory kickboxing rules infraction. Malik Blake (Team Tiger Schulmann in NYC) vs. Modified Muay Thai Rules │ 175 lbs. │ 3×2. Shannon’s recoil from a comparably vicious hobbling goblin got him leaning into harm’s way. The harm came by way of a skull crushing round house that demolished his entire House of Cards. “All the king’s horses and all the king’s men couldn’t put Humpty together again.” With Sara Schulmann in the house, who even cared whether the fat lady sang? WINNER: Malik Blake KO at 1:53 of Round 2. Niko Tsigaris (Lions Martial Arts in Brooklyn) def. Shennen Maceo (Team Tiger Schulmann) by TKO at 1:20 of Round 1 │ 152 lbs. │ 4×3. Jennie Nedell (Longo Competition Team on Long Island) def. Jamie Driver (Renzo Gracie in Pennsylvania) by Unanimous Decision: All three judges scored it 30-25 │ 148 lbs. │ 3×3. Zarrukh Adashev (Lions Martial Arts in Brooklyn) def. Robert Walker (Walker Muay Thai in Dayton, Ohio) by TKO at 2:56 of Round 2 │ 135 lbs. │ 3×3. Malik Blake (Team Tiger Schulmann in NYC) def. Shannon Halstead (Dambakely Martial Arts in North Carolina) by KO at 1:53 of Round 2 │ 175 lbs. │ 3×2. Andrew Ball (Neglia Competition Team in Brooklyn) def. Dominick Dunning (Team Top Notch in Chicago) by TKO at 0:30 of Round 1 │ 185 lbs. │ 3×2. Angel Rodriguez (Team Tiger Schulmann) def. Alberto Ramos (Golden MMA Warriors in NYC) by Unanimous Decision: 30-27, 30-27 and 29-28 │ 185 lbs. │ 3×2. Chris Edmund (Wilkie’s Warriors in New Jersey) def. Danila Sherstobitov (Tiger International in Brooklyn) by Split Decision: 29-28, 28-29 and 30-27 │ 170 lbs. │ 3×2. Brian Mayer (Wilkie’s Warriors in New Jersey) def. Mike Sollecito (Alpha Omega on Long Island) by TKO at 0:17 of Round 1 │ 165 lbs. │ 3×2. John Giordano (Longo Competition Team on Long Island) def. Jarad Williams (Alpha Omega on Long Island) by KO at 0:29 of Round 3 │ 215 lbs. │ 3×2. Nazim Sadikhov (Lions Martial Arts in Brooklyn) def. Brandon Cuttino (Team Tiger Schulmann) by Unanimous Decision: 30-26, 30-26 and 29-27 │ 155 lbs. │ 3×2. Brad Schleir (Longo Competition Team on Long Island) def. Aaron Lee (Mercer Bucks Muay Thai in New Jersey) by TKO at 1:04 of Round 3 │ 230 lbs. │ 3×2. Damien Bailey (Team Tiger Schulmann) def. Art Daley (Team Top Notch in Chicago) by TKO at 1:55 of Round 1 │ 145 lbs. │ 3×2. Juan Vides (Team Tiger Schulmann) def. Nick Ascolese (Wilkie’s Warriors in New Jersey) by TKO (DQ) at 1:27 of Round 2 │ 135 lbs. │ 3×2. Jennifer Ventriglia (Alpha Omega on Long Island) def. Allison Dichetear (Team Inner “G” in New York City) by Unanimous Decision: All three judges scored it 30-27 │ 115 lbs. │ 3×2. Justin Muslija (Team Tiger Schulmann) def. Robert Wallin (Alpha Omega on Long Island) by Unanimous Decision: All three judges scored it 30-27 │ 115 lbs. │ 3×2. Jonathan DiBella (Angelo’s Kickboxing in Montreal, Canada) def. Daniel Nelson (Team Combat in Richmond, Virginia) by KO at 1:31 of Round 2 │ 135 lbs. │ 3×2. Bridgitte Hilton (Alpha Omega on Long Island) def. Anastasia Malyarenko (Wolfson’s Martial Arts in Brooklyn) by Unanimous Decision: 29-28, 29-28 and 30-27 │ 125 lbs. │ 3×2. Even though K-1/Glory kickboxing rules are like the “PG” rated version of Full Rules Muay Thai – which might explain why Brian Crenshaw thinks that censorship is the new normal – key word edgy in a music video and follow Sannya Fox CUBEINART Photography on Facebook. CLICK HERE for Peter Marney’s Photo Gallery. Dan Eric’s Photo Gallery is also a CLICK AWAY. Commercial necessity in the demographics of box office patronage informs match making for local shows. Just about all of them end where they begin. What goes around comes around, for both the box office and pro prospects. This commercial equivalent of a centrifuge, thus, engineers internal combustion into local circuitry. Now you know why cottage industry equities tend not to be listed on the New York Stock Exchange. Measuring success also by his graduation rate, the synergist in Lou Neglia thinks outside the local box office. Packaging Combat at the Capitale │ Battle of the Millennium with Ring of Combat makes for the enterprise equivalent of punching in combinations. Lou Neglia’s enterprise comprises a whole, in other words, that’s greater than the sum of its parts. So MMA prospects and their trainers hearken unto this synergy for a ticket to ride the UFC’s gravy train. This beckons them to board the train on Lou’s platform, which then taps into a relational database of fan traffic. It turns out that Lou’s thinking outside the local box office ends up boosting it out of a centrifugal cottage industry death spiral. This entry was posted in News & Results and tagged Andrew Ball, Brian Crenshaw, Chris Mauceri, featured, Gabe Varga, Glory World Series, Jennie Nedell, John Bowman, Julio Arce, K-1, Kevin Van Nostrand, kickboxing, Lou Neglia, main featured, Malik Blake, Most Featured, Muay Thai, Niko Tsigaris, Phanuwat "Coke" Chunhawat, Shane Oblonsky, WKA, Zarrukh Adashev. Bookmark the permalink.